Create the authentic look of the Alpine ski lodge bar unit. Ideal prop for the Apres Ski themed event or Christmas in Lapland. The Bar is fitted with one of our standard bar units giving the user a shelf and facility to attach beer pubs if Keg beer is being used. 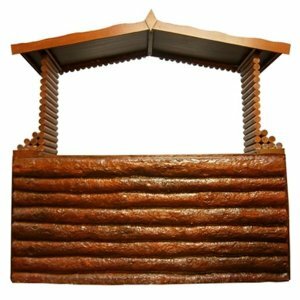 The wood effect decoration and pointed roof makes this a must for the outdoor Christmas scene.